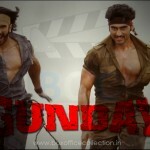 Latest song from the upcoming Bollywood movie Gunday has been released today at 2:00 PM named Asalaam-e-Ishqum. This song is very fascinating and has been sung by Bappi Lehri and Neha Bhasin. The song has been presented adorably by the voices of these singers and harmonized ingeniously by Sohail Sen. This song features the main leads of this movie Gunday – Ranveer Singh and Arjun Kapoor. This song has released nearly one hour before but has very magnificently attracted the audience towards it. The song is very catchy and entertaining. Voice of the singers is also being appreciated by the viewers on YouTube and other mediums. This song will definitely hit the chartbusters very soon due to public craze and favorable reaction. Here we are providing you the lyrics of the latest released song Asalaam-e-Ishqum Yaara from Gunday movie with some additional details about the song.